LatinaLista — Perhaps no other ‘bad press’ haunting this presidency has been the perception that the White House, namely Trump, actively tried to pressure the former FBI Director James Comey to stop investigating the former national security adviser Michael Flynn and any administration connections to Russia. While Trump and his staff have loudly denied that anything inappropriate occurred between Trump and Comey, Comey has been largely silent — until now. 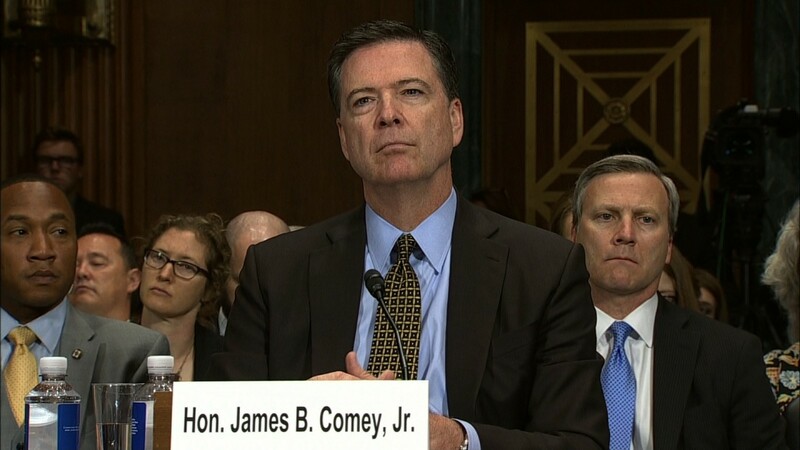 Tomorrow morning, June 8, former FBI Director James Comey will testify before the Senate Select Committee on Intelligence about his interactions with Trump. The following is Comey’s opening remarks to the Senate Select Committee on Intelligence. from my conversations with the President, but, to the best of my recollection, I have tried to include information that may be relevant to the Committee. I first met then-President-Elect Trump on Friday, January 6 in a conference room at Trump Tower in New York. I was there with other Intelligence Community (IC) leaders to brief him and his new national security team on the findings of an IC assessment concerning Russian efforts to interfere in the election. At the conclusion of that briefing, I remained alone with the PresidentElect to brief him on some personally sensitive aspects of the information assembled during the assessment. The Director of National Intelligence asked that I personally do this portion of the briefing because I was staying in my position and because the material implicated the FBI’s counter-intelligence responsibilities. We also agreed I would do it alone to minimize potential embarrassment to the President-Elect. Although we agreed it made sense for me to do the briefing, the FBI’s leadership and I were concerned that the briefing might create a situation where a new President came into office uncertain about whether the FBI was conducting a counter-intelligence investigation of his personal conduct. States or to steal our secrets. The FBI uses that understanding to disrupt those efforts. Sometimes disruption takes the form of alerting a person who is targeted for recruitment or influence by the foreign power. Sometimes it involves hardening a computer system that is being attacked. Sometimes it involves “turning” the recruited person into a double-agent, or publicly calling out the behavior with sanctions or expulsions of embassy-based intelligence officers. On occasion, criminal prosecution is used to disrupt intelligence activities. warranted. During our one-on-one meeting at Trump Tower, based on PresidentElect Trump’s reaction to the briefing and without him directly asking the question, I offered that assurance. I felt compelled to document my first conversation with the President-Elect in a memo. To ensure accuracy, I began to type it on a laptop in an FBI vehicle outside Trump Tower the moment I walked out of the meeting. Creating written records immediately after one-on-one conversations with Mr. Trump was my practice from that point forward. This had not been my practice in the past. I spoke alone with President Obama twice in person (and never on the phone) – once in 2015 to discuss law enforcement policy issues and a second time, briefly, for him to say goodbye in late 2016. In neither of those circumstances did I memorialize the discussions. I can recall nine one-on-one conversations with President Trump in four months – three in person and six on the phone. Green Room at the White House. He had called me at lunchtime that day and invited me to dinner that night, saying he was going to invite my whole family, but decided to have just me this time, with the whole family coming the next time. It was unclear from the conversation who else would be at the dinner, although I assumed there would be others. It turned out to be just the two of us, seated at a small oval table in the center of the Green Room. Two Navy stewards waited on us, only entering the room to serve food and drinks. and could not be counted on in the traditional political sense, a stance I said was in his best interest as the President. that he should give that careful thought because it might create a narrative that we were investigating him personally, which we weren’t, and because it was very difficult to prove a negative. He said he would think about it and asked me to think about it. The last person to leave was Jared Kushner, who also stood by my chair and exchanged pleasantries with me. The President then excused him, saying he wanted to speak with me. concerning, given the FBI’s role as an independent investigative agency. sense to report it to Attorney General Sessions, who we expected would likely recuse himself from involvement in Russia-related investigations. (He did so two weeks later.) The Deputy Attorney General’s role was then filled in an acting capacity by a United States Attorney, who would also not be long in the role. Shortly afterwards, I spoke with Attorney General Sessions in person to pass along the President’s concerns about leaks. I took the opportunity to implore the Attorney General to prevent any future direct communication between the President and me. I told the AG that what had just happened – him being asked to leave while the FBI Director, who reports to the AG, remained behind – was inappropriate and should never happen. He did not reply. when in Russia. He asked what we could do to “lift the cloud.” I responded that we were investigating the matter as quickly as we could, and that there would be great benefit, if we didn’t find anything, to our having done the work well. He agreed, but then re-emphasized the problems this was causing him. Then the President asked why there had been a congressional hearing about Russia the previous week – at which I had, as the Department of Justice directed, confirmed the investigation into possible coordination between Russia and the Trump campaign. I explained the demands from the leadership of both parties in Congress for more information, and that Senator Grassley had even held up the confirmation of the Deputy Attorney General until we briefed him in detail on the investigation. money. Although I didn’t understand why the President was bringing this up, I repeated that Mr. McCabe was an honorable person. ability to do his job. He said that perhaps he would have his people reach out to the Acting Deputy Attorney General. I said only that the way to handle it was to have the White House Counsel call the Acting Deputy Attorney General. He said that was what he would do and the call ended.